As November winds down, I thought I’d round up the most popular blog posts of the month, items from our Facebook page, and stuff we loved around the web. Enjoy! If you love to read about decorating, you might be interested in this offer from Hearst Magazines (which we originally ran on our Facebook page). Through December 13, 2012, you can give or get a subscription to any of their 18 titles for just $5 per year! Wowser. Take your pick of popular decorating magazines like Elle Decor and Country Living, lifestyle magazines like Town & Country and Cosmopolitan, and guy titles like Car & Driver and Popular Mechanics. Note this isn’t an affiliate link. It’s just a good deal I’d thought I’d pass along! In the continuing adventure of our bungalow renovation, this post about our decision to re-side the house with HardiPlank generated helpful comments and advice from readers. 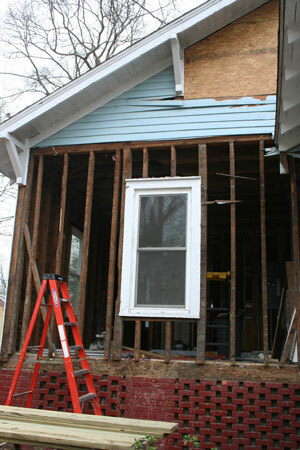 Oh, and did we mention when we pulled the old siding down we found termites? Great. I’m a fan of re-using and re-purposing old objects, including furniture, to suit modern needs. I loved this idea from Domino Magazine (shared on their Facebook page) to use china as flowerpots. Although the chinaware shown isn’t old, you certainly could use old pieces, which would add still more charm to your vintage interior. By the way, did you know we carry upcycled light fixtures? Check out these this line of chandeliers and light fixtures hand crafted by artists in Tennessee from old silver tea sets, silver spoons, vintage electrical insulators, and old key plates! Readers told me they enjoyed our Thanksgiving wine guide, which of course will work for any occasion! Many people tell me they struggle with how to work fine antique French furniture into their decor. It can seem like a challenge, especially if you’ve inherited or purchased various styles over the years. Our clients Julie and Bruce V. of Whitmire, South Carolina, do an excellent job at combining old and new pieces into their design scheme. We featured their home recently in our customer spotlight. Lastly, I leave you with this. As you wrap, pack, and ship your presents this holiday season, do you get “help” from a furry friend? This handsome fellow, shared by Cute Animals on Facebook, garnered a lot of comments from our friends and fans. Did you know a portion of all our sales goes to PETS, Inc.? We’re passionate about animal welfare, and we love supporting PETS, Inc. Pet lovers won’t find a more worthy charity to support during this holiday season. December is fast upon us. I’ll see you next week with some Things We Love. What do you love at this time of year? This entry was posted in News and tagged animal welfare, bungalow, charity, cheap, kittens, kitties, light fixtures, magazines, pets, Pets Inc, renovation, subscriptions, upcycle, upcycled, upcycling, wine guide on November 29, 2012 by euroluxantiques. I love decorating for the holidays. Putting up the Christmas tree and stringing lights and garlands helps me get into the holiday spirit. After the decorations are up, I finally begin to truly anticipate the wonderful family time to come. Inspired by this “Decorating: Holiday Mantels” slideshow at Traditional Home magazine’s website, I’ve put together a group of photos to inspire you in adorning your home for the holidays. Whether you’re decorating an antique Victorian mantel or the rustic fireplace at your Christmas cabin, you’ll find ideas you can use or adapt to fit your decor. As a bonus, I’ve included a few exterior treatments, as well, to show how you can showcase the front of your stately Victorian or cozy cottage for the holidays. Enjoy! A beautiful mantel doesn’t have to be fussy. Here, a small nativity set literally framed by a black picture frame hung with simple red ornaments creates a lovely display with a faux, lighted garland. A very stylish and classy look! This traditional parlor looks very festive with its classical carved fireplace surround swagged with beads and topped with a wreath. I love the way the antique mirrors flank the fireplace for symmetry. And note the beautiful antique demilune table to the right. This classic treatment will work well in your Victorian home. Heading up to your cabin for the holidays? Let this fun, lodge-style holiday decor inspire you! The cow skull wrapped with silver beaded wire creates a festive look, while the garland brings the outdoors inside. Hanging stockings complete the traditional look. This design, which could look kitschy in a different setting, looks very natural here. This antique fireplace gets a spectacular holiday makeover using just two colors: white and green. The key here is over-the-top styling. Mounds of white poinsettias ground the vignette, while the faux snow sculpture inside the fireplace box creates an unexpected and delightful surprise. On the mantel, large green ornaments, white snowflake decorations, and a white beaded strand top a thick natural garland. You could really wow your guests by pulling off this look! You can make a splash outdoors, too. Let your exterior decor complement your home’s style for maximum impact. 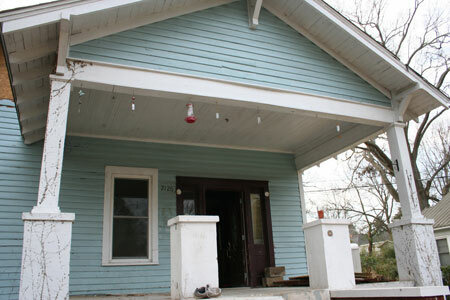 Here, a city house gets a bold, traditional treatment by running a lighted garland up the railing to the front door. Classic red bows start at the top of the house and continue all the way to the street. This design isn’t overwhelming because it’s scaled to the size of the house. Very appealing! Cottage style is all about the eclectic combination of colors, patterns, and textures, along with a mix of old — and older! — furnishings. Here, the decorator takes cottage style outdoors by creating a garden of light. The green verge defines the garden’s edge, while lavender lights create perhaps a lilac bush, and gold lights along the ground evoke a carpet of daffodils. The wispy holiday lights capture the essence of breezy cottage style. Well done! We’d love to see how you decorate your home for the holidays, both indoors and out! Send us your photos or link to them in the comments. This entry was posted in Holiday Fun, Home Design Ideas and tagged Christmas, Christmas lights, cottage holiday design, cottage style, decorating your mantel, holiday, holiday lighting, holidays, lodge Christmas, lodge decor, mantel, mantels on November 27, 2012 by euroluxantiques. 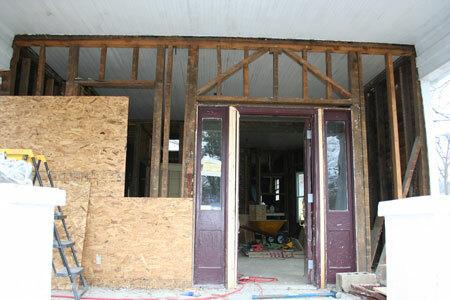 We’ve knocked out quite a few big projects during our 1920s bungalow renovation. At the same time, we’ve also been trying to get the yard under control. I’ll post a few photos to remind you how much the yard resembled a jungle. The next-door-neighbor swears absolutely no yard work was done for about 10 years. Although you might not notice it, that is poison ivy underneath the handicap ramp and completely covering the back yard. Greg and I estimate we hauled about 9,000 pounds (4.5 tons) of leaves and vines, in addition to all of the limbs, from the back yard to the front yard. We actually got in a fight with the City of Newberry about how much landscaping debris is allowed to be picked up from a residence. We argued that since the former owner did not put out any debris for years, we had a credit coming to us, and besides, didn’t the City *want* us to clean up this property? In the end, our neighbors on either side allowed us to divide the piles into thirds, and then the City had to pick it all up. #Winning. Yes, you may have noticed that we also put up a privacy fence along the left property line that joined to an existing privacy fence along the back. There is currently a chain link fence along the right property line that we plan to replace in the future. We also planted small arborvitae evergreen trees along the sides of the backyard, which should grow 15+ feet tall. This shot was obviously taken before we put up the new exterior siding. I wanted to show you how it looked after we cleaned up the front yard, but before we started landscaping – in the next blog. This entry was posted in Vintage Life: Our 1920s Bungalow and tagged 1920s Bungalow Renovation, landscaping, Vintage Life on November 26, 2012 by euroluxantiques. Julie and Bruce V. of nearby Whitmire, SC, love color and aren’t afraid to show it in their wonderful, old historic home. They recently purchased two pieces, a large 1890 Louis XV oak buffet for their dining room and a highly carved antique Brittany armoire for their master bedroom. Let’s look at how Julie and Bruce skilfully combine fine antiques with more modern furniture to seamlessly create an interior design that reflects their unique taste. Julie and Bruce create a warm, inviting dining area using both antique and modern pieces. The fantastic, heavy oak Louis XV buffet that they purchased from EuroLux Antiques is beautifully framed by centering it on the wall. Note how the red hue of the wall burnishes the warm brown finish of the oak. Stunning! It always amazes me what a key role color plays — be it in the finish of the antiques or the colors in a room — in setting a mood. This dining area has a welcoming look that invites a person to stay awhile. Also note how Julie and Bruce play off the style of the gorgeous crystal chandelier by incorporating candlesticks with crystal pendants. Small touches like this reinforce the design scheme. Well done! In the master bedroom, Julie and Bruce found a place for this sensational, carved chestnut Brittany armoire. I want to point out how beautifully the color and finish of the antique armoire match the modern bed posts. This bedroom is an absolutely great example of how it’s possible to seamlessly incorporate fine antiques (the Brittany armoire dates to 1890) into a modern home with new, fine furniture. Here’s a wider shot of the master bedroom so you can see more of the design scheme. Obviously, Julie and Bruce love red, and they know how to use it to bring a warm “pop” to each room. Note, too, how the mirrored front of the buffet reflects the light to beautiful effect. This blog post could have been titled “red done right” because Julie and Bruce never overwhelm their decor with their favorite color. They use it judiciously to create an appealing environment for themselves — and their 7 (or is it 8 by now, Julie?) children! Yes, you can live the antiques lifestyle with small children. Julie and Bruce’s family is living proof of it! Many thanks to Julie and Bruce for “inviting” all of us into their home by sharing photos of their lovely interior. One of the best things about this business is finding great homes for old treasures and then hearing from our clients how they are putting these beautiful antiques to use in their lives. If you’d like to see your decor featured on our blog, just drop us an e-mail! We’d love to hear from you. This entry was posted in Client Spotlight and tagged antique buffet, Brittany, combining antiques and modern, decorating with red, Louis XV, red, red decorating, red design, red interior, red interior design, using red in rooms on November 23, 2012 by euroluxantiques. We normally use this blog to share decorating tips and design inspiration to help you enjoy living with your antiques. But perhaps you’ll indulge us during this festive season to shamelessly self-promote for a moment. During our Black Friday sale, which begins today and runs through Monday, November 26, we’re offering 20% off everything in our gallery, plus our usual free shipping! Since many of our readers are only just getting to know us, we thought we’d share some holiday gift ideas from our own inventory. All of our antiques are one-of-a-kind, of course, and we also offer high-quality reproduction furniture and accessories that suit all tastes and budgets. Here are some great ideas for all the people on your Nice (and Very Nice) List this year. Use code SHOPSMALL at checkout to receive your discount. Happy shopping! This lovely cabinet dates to 1880. You might use it to display your heirloom china, books, or collectibles this holiday season. Burled walnut veneers and a mirrored back add the “wow factor” to this lovely server, which dates to 1920. Picture it sitting in your dining area, wrapped with a big, red ribbon! We have antique furniture choices to suit every taste and budget. Find them here. One of our favorites, this delicate chandelier features its original paint. It makes a lovely gift for your loved one. As featured in our newsletter, this sensational mantel clock will make an impressive gift and a stunning display piece for any clock collector or bronze sculpture enthusiast. If you prefer your goddesses with unicorns (and who doesn’t, really? ), this sensational medallion or plate will wow you. A thoughtful gift for any unicorn-lover on your list! Who among us doesn’t have to cope with the issue of mixing inherited pieces of various vintages with items that reflect our own taste? The items featured here help bridge the gap between antique and modern decorating schemes. Traditional in form but modern and upscale in its gold plated finish, this high-quality reproduction chandelier is your ticket to fine living. Heirloom quality, this chandelier is the item your kids will fight over when you’re gone. Traditional French design gets an update in the shiny, polished nickel finish and white stone top. Makes a great gift for the young person who’s living with a bunch of hand-me-down ’70s furniture and could use something shiny to cheer up their decor. We said we have something for every price point, and here’s the proof! Straight from Old Blighty comes this sensational old advertising tray. This would make an excellent host/hostess gift for your next holiday cocktail party! And it’s yours for a mere $41.60 after applying the Black Friday discount! Seasonally appropriate and perfect for any skating enthusiast on your gift list, this lovely vintage plate also will please any collector of blue-and-white ware. You can get it for just $47.20 after the Black Friday discount. Another fantastic host/hostess gift, this pair of vintage beer glasses dates to 1950. Know any home brewers? They’ll be delighted to receive these! Only you will know you spent just $23.20 after the Black Friday discount. If you long to live the antiques lifestyle but find yourself inhabiting a cramped urban loft, pied a terre, or cottage, you’ll be happy to know today’s exceptionally high-quality reproduction antiques are sized to fit your space perfectly. Traditional styling meets modern sizing in this petite chest that measures just three feet wide by 32 inches high. The fun deco-inspired design and mirrored finish will add an antique touch to your small space. This sensational chest of drawers looks just like a real antique, but it’s actually a high-quality reproduction. Yes, that’s hand carving on the front! Best of all, this little chest measures a petite 32 inches wide by 35 inches high, so it will fit into your apartment, condo, or loft. You’ll find 63 more small-scale items by searching “petite” at our website! Thanks for shopping EuroLuxAntiques.com. We welcome your comments, questions, and phone calls! This entry was posted in Holiday Fun and tagged 2012, antiques, Blue Delft, budget gifts, clocks, Delft, furniture, holiday gift guide, holiday gifts, petite, urban on November 21, 2012 by euroluxantiques. Vintage Life: Up with New Siding! 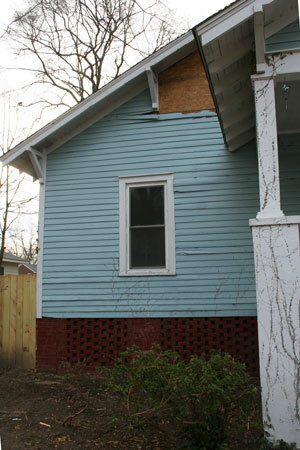 After we pulled down all of the original, dilapidated lap siding and repaired the termite damage to the front sill, we put up OSB all around the house. The next step was to put up felt paper, which acts as a water barrier, and then hang the new primed HardiPlank lap siding. And at long last, we finished the exterior siding project! We think the house looks a million times better already. This entry was posted in Vintage Life: Our 1920s Bungalow and tagged hardiplank siding, old house renovation, Vintage Life on November 19, 2012 by euroluxantiques. Lighting can have a bigger impact on a room’s mood than even color or furniture. Those latter two attributes may give you a quick impression of a room’s decor — Victorian, mid-century modern, shabby cottage — but lighting can transform any design scheme from cool to warm literally with the flick of a switch. Here are three tricks for creating mood with your home lighting. When you choose a light fixture for your home, think not only about where you plan to locate it or the style of your decor but also about how the fixture will affect the way the light is displayed within the setting. For example, a large crystal chandelier makes a certain statement in its opulence, but it also tends to scatter bright light, which results in dazzling patterns dancing on the ceiling and walls. You can control the level of this effect by hooking your antique or vintage crystal chandelier up to a dimmer switch. Stained glass wall sconces can create extraordinarily warm accent lighting, depending on the color of the glass. Enclosed sconces that mount flush against the wall tend to push light back against the wall, allowing only a small amount through the glass. This creates a cozy glow and sense of intimacy. Glitzy reproduction candle sconces, on the other hand, can cast a lot of light into a small area. These fixtures can help brighten large spaces. Pendant fixtures come in an array of styles, and some of them act like sconces in that they push light toward the ceiling as well as directing light downward through the glass shade. These lights make great fixtures for entryways because they provide enough light to illuminate the darkness but also cast warm shadows onto the ceiling for a welcoming touch. Of course, you always want to include a variety of light sources within your design scheme, including up lights that cast light up from the floor, floor and table lamps that illuminate their immediate surroundings, and chandeliers or flush-mount ceiling fixtures that cast light downward. By integrating each type of lighting into your design, you’ll be able to set any mood you desire. This entry was posted in Home Design Ideas, Vintage Lighting & Chandeliers and tagged chandeliers, crystal chandeliers, light fixtures, lighting, mood, mood lighting, pendant lights, Tiffany lamps, wall sconces on November 15, 2012 by euroluxantiques. Although we thought we were finished with the demolition phase of our 1920s bungalow renovation, we realized we weren’t quite done. 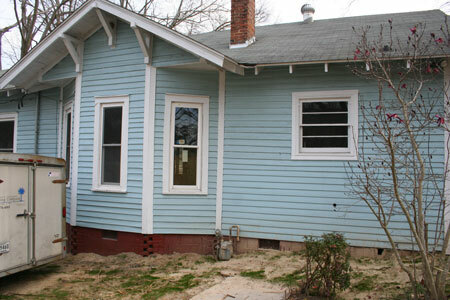 The original wood lap siding was in terrible condition, so we decided that had to go too. We had quite a few people slamming on their brakes while driving past our little bungalow. It’s not often you can see straight through a house. Of course, we’ve also learned to expect the unexpected. (Wait – wasn’t the replacing of the siding unexpected in the first place? Yep, is the answer to that.) 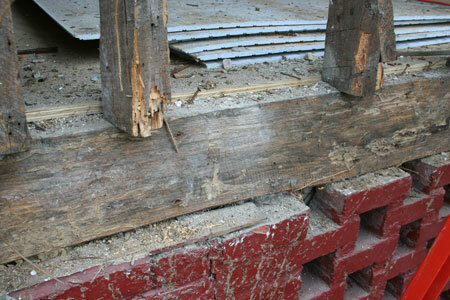 So we weren’t surprised to find that the front sill had significant termite damage. 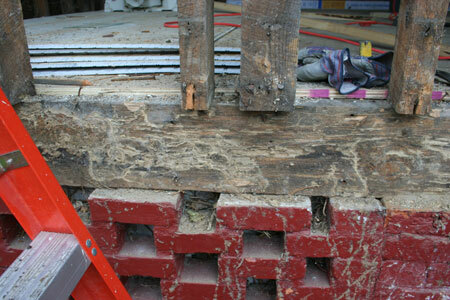 Yikes – those termites had been munching out for quite awhile! Unfortunately we forgot to take the after photos – I think we were too tired from jacking up the supports, cutting out the bad parts, and replacing it with a nice, new sill. This entry was posted in Vintage Life: Our 1920s Bungalow and tagged old house renovation, termite damage, Vintage Life on November 12, 2012 by euroluxantiques. When we purchased our 1920s bungalow, we knew we had a ton of work to do: demolition, moving walls, rewiring, replumbing, et cetera. 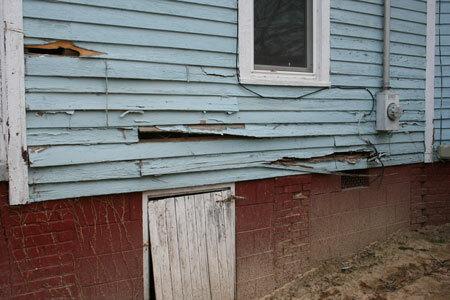 However, the original wood lap siding looked like it was in pretty good shape. We knew we had areas that would need some repair and patching. 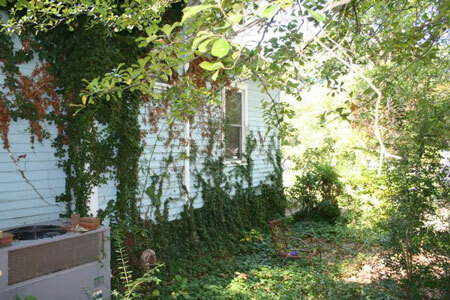 And of course the whole house would have to be scraped and repainted, especially because of the ivy jungle on one side. 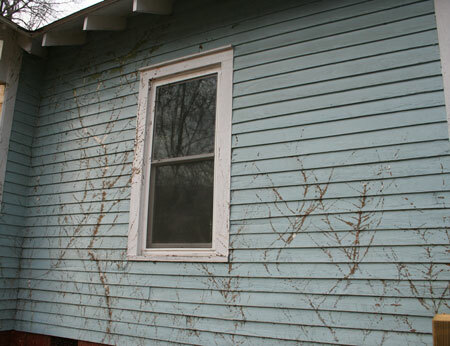 This is a reason NOT to let ivy grow on your house. 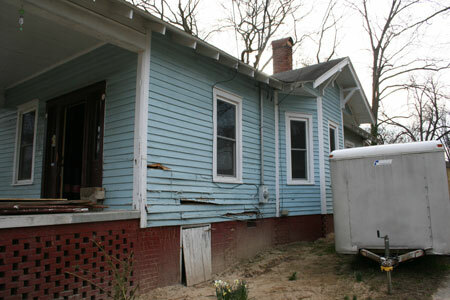 However, once we had finished all of the demolition and pulled down the walls inside the house, we realized that pretty much all of the siding was in very poor shape. It would be more labor intensive to patch it than to just pull it all down and start again. That seems to be a common answer to unexpected problems in our renovation process. We decided to go with HardiPlank lap siding rather than regular wood siding as it doesn’t rot, doesn’t burn, and supposedly paint adheres to it very well, reducing the required maintenance. Although you can order it already painted, we didn’t really care for any of the stock colors. 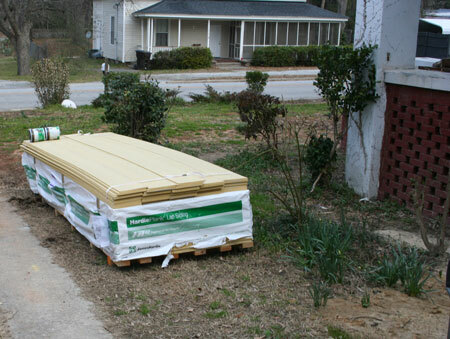 So here is our giant pile of HardiPlank siding in yellow primer waiting for us to get started – in the next blog post. This entry was posted in Vintage Life: Our 1920s Bungalow and tagged exterior lap siding, old house restoration, Vintage Life on November 8, 2012 by euroluxantiques.